Anyone itching for another review? In My Opinion, you should be. Because this post I’ll be writing about a novel I recently finished called The Perfect Drug by Hollie DeFransisco. Hollie DeFrancisco is another author who I entered into a review exchange with, and it was an absolute pleasure to meet her. First and foremost, Hollie is actually an artist, a painter mostly, and does some incredible work. 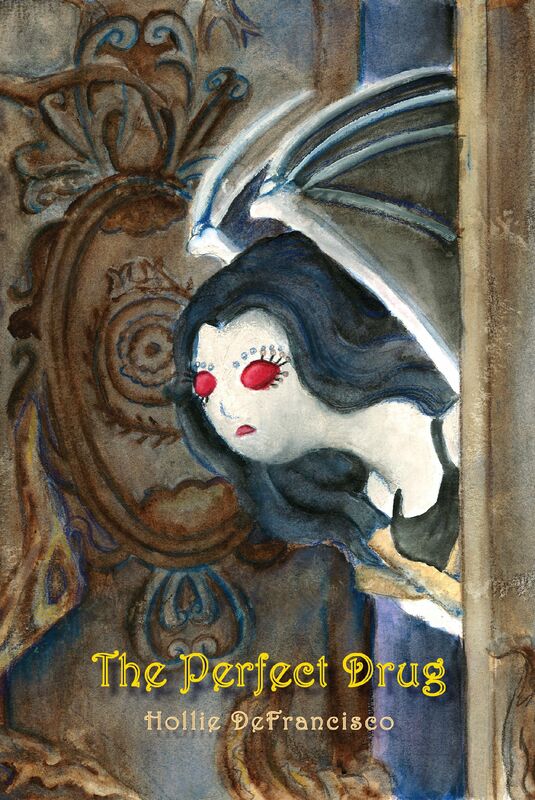 She painted the cover for her book, as well as dozens of other really breathtaking portraits. You can check out her gallery here. Hollie does book designs for indie authors, as well as some black and white stuff. Bottom line is, she’s rather talented. Now let’s get to the book! Plot: The plot of the story follows a girl, who is actually a demon, as she struggles to find a place to fit in in our world. It’s a lot more than that… but that also just about sums it up. Adelice, the main character, lives in a house with a few other mythical/supernatural creatures and acts as their huntress, if you will. All of her roommates require blood to survive, but lack the murderous intent to gather it. Adelice does not. She be killing people left and right. Or did, at least. The story begins with Adelice in a serious relationship with a guy named Trent and proceeds to show just how unstable their love really is. The beginning does take a sort of TV drama sense as it establishes characters through unenthusiastic fights and a lot of “yeah, whatever” responses. But the story picks up about halfway through when hidden plots and secondary motives arise to throw Adelice way out of her comfort zone. Though the beginning moved slowly, it really did pick up about halfway and a truly good story blossomed out of it. Characters: As I mentioned, I really wasn’t a big fan of the characters at first in the novel, simply because they all acted like spoiled high schoolers… In my opinion. I just… yeah. It was sour in the beginning. But then one character, a witch it turns out, really started to develop into her own person. Then a few more started to show very distinct personalities as action grew and the end neared. I was much more accepting of them by the end. Imagery: This is where the story shines. The descriptive narrative that takes place is top notch. Reading the beginning of the book impressed me in that it flowed better than a few traditionally published novels I’ve read this summer. Hollie drops some fantastic vocabulary to spice up the writing, and created a handful of extra characters that really drew my attention. It almost felt like a Hellboy movie or something, with the vast mix of different who-knows-what creatures going about their business. Verdict: If you like paranormal/supernatural stuff with a strong Buffy the Vampire feel to it, check out this book. If anything fantasy related or remotely creepy turns you off, stay away. That is, of course, my opinion.